Exhibit A: At some point in my childhood I graduated from the ‘single’ bed to a double bed… It was the old bed frame from the cottage with a new mattress. It had real “springs” that sat on the metal frame…but sometimes it didn’t sit so well… and with time and age… it would get ‘knocked’ off… and basicly would dramatically TIP the bed…sometimes it was just the BOTTOM corner.. so your feet tip at a weird angle… but other days it would be one of the top sides… and it would be your HEAD drasticly at an angle… this always seemed to happen at like some crazy hour.. after been sleeping for hours… so what’s a girl to do? well just change her direction in the bed.. (rather than getting up, taking off the blankets/sheets/pillows, pushing that giant mattress off the bed, then wiggling and getting the springs out of the mess that they are in..(often they were wedged and couldn’t come out easily)…and then setting everything back up for sleep… that’s a lot work… so I would do it in the morning.. Or more realistically just before I crawled back into bed for sleep the next night. My mum got use to the CRASH/BANG coming from my room… I think it happened on a nightly basis for awhile! 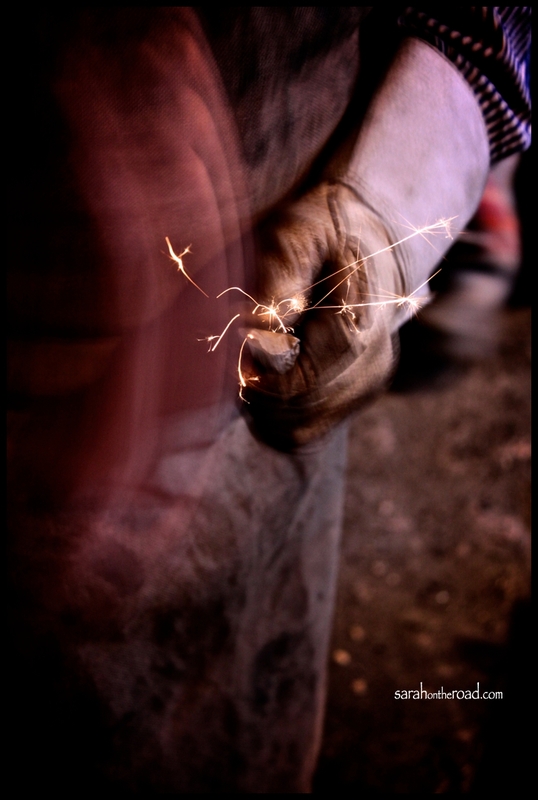 I’m just a crazy restless sleeper… my Grandpa the fall before he passed away… helped fix the problem and cut slats to put across the frame so that the springs would sit on them! I LUV this bed…. it’s a really cool frame… (here’s a photo from my old apartment in Toronto….) isn’t it pretty? Lesson learned.. probably should have fixed the rails…. but then again.. that’s a lot of work.. and well it’s the middle of the night… But I think I need a better solution to my problem.. any suggestions? feel free to comment away!!! On a side note… I’m so missing my little Bro… bc he would totally have some crafty idea and the tools to implement the plan to fix the problem! Hmmmm did I just really do a whole post about sleep and beds.. and how I can’t sleep in them properly? yes, yes I think I did…. it’s not my fault I’m just a crazy sleeper! 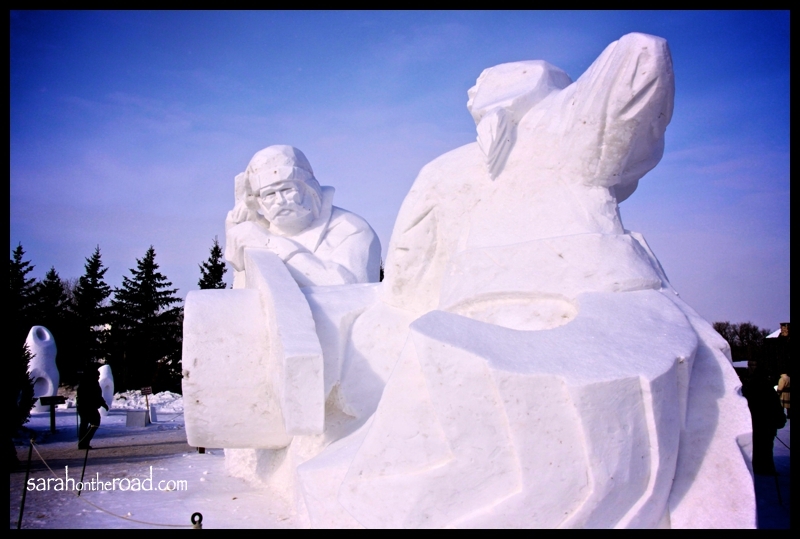 This entry was posted in Life in Manitoba on February 24, 2010 by Sarah on the Road. 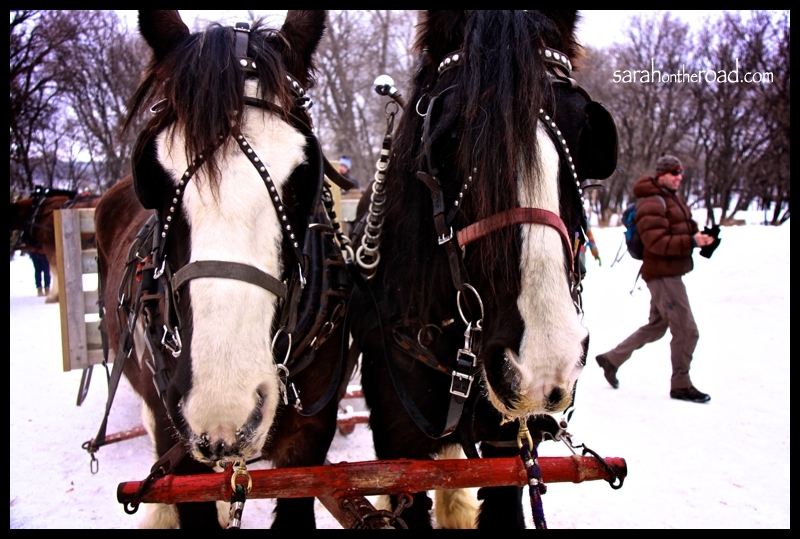 Today I went to Festival du Voyageur! This is a fun celebration.. that celebrates the fur trade, the voyageurs and all things french in Manitoba…. 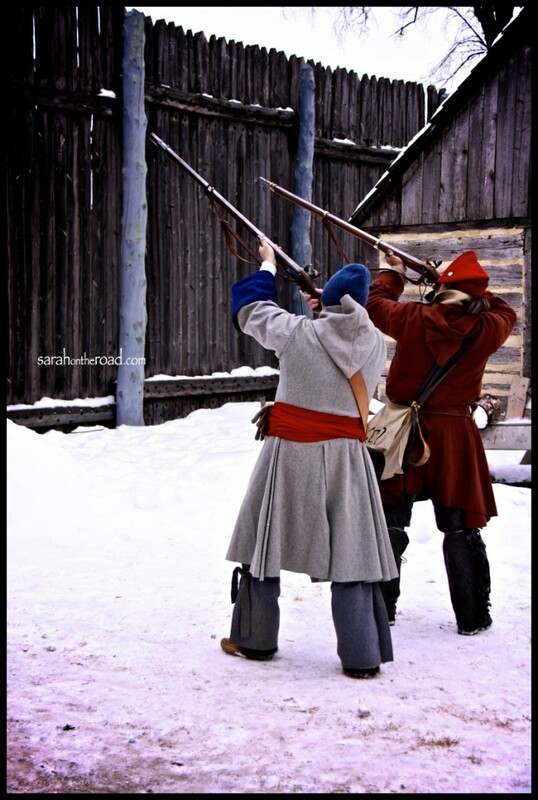 I had a blast, I love all things historical… (hence my first BA with a major in history)…and the festival didn’t disappoint! I went with one of my co-workers, two children she knows, her mum and her mum’s homestay student from China…and later another friend of my co-worker, her husband and her two kids! 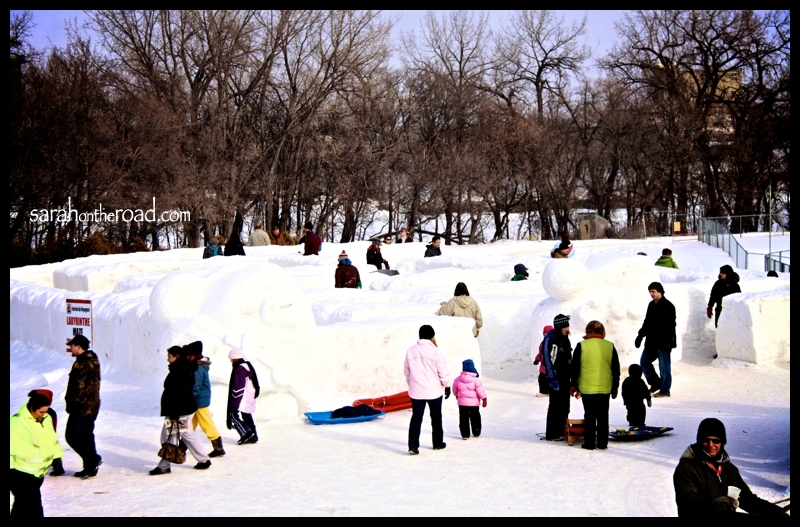 It was way fun to go to something like this with kids…and not all on my own!! Thanks so much for thinking of me…. 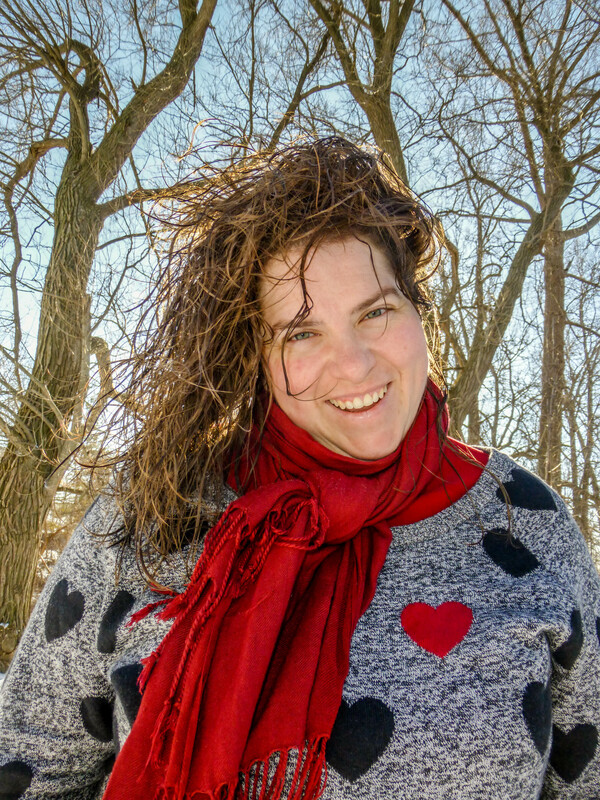 Andrea… you rock!! 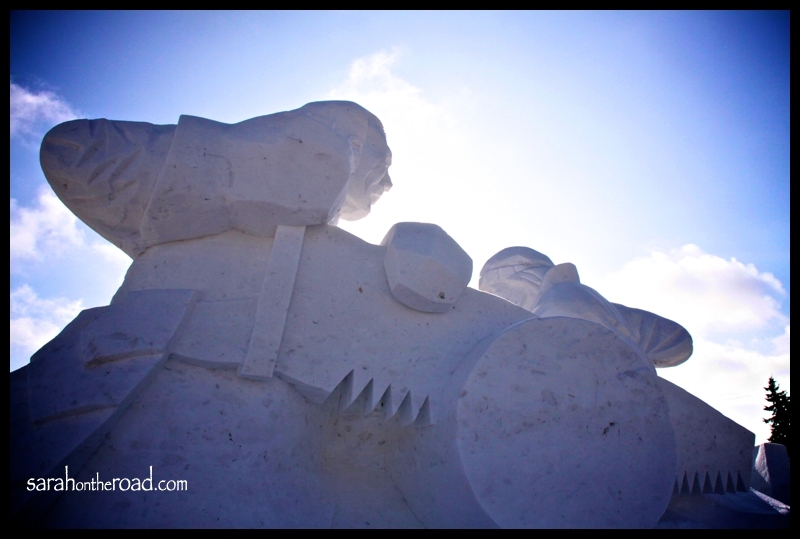 There were quite a few snow sculptures…because of the weather we have been having… (nice…and fairly warm) some of the sculptures were melting! but they were pretty awesome to look at! 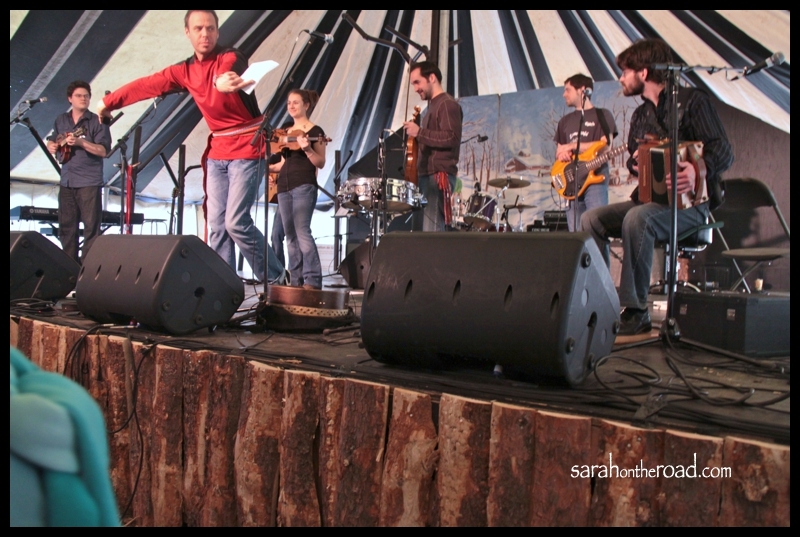 Teams came from around the world to compete in this competition….the end result was amazing! 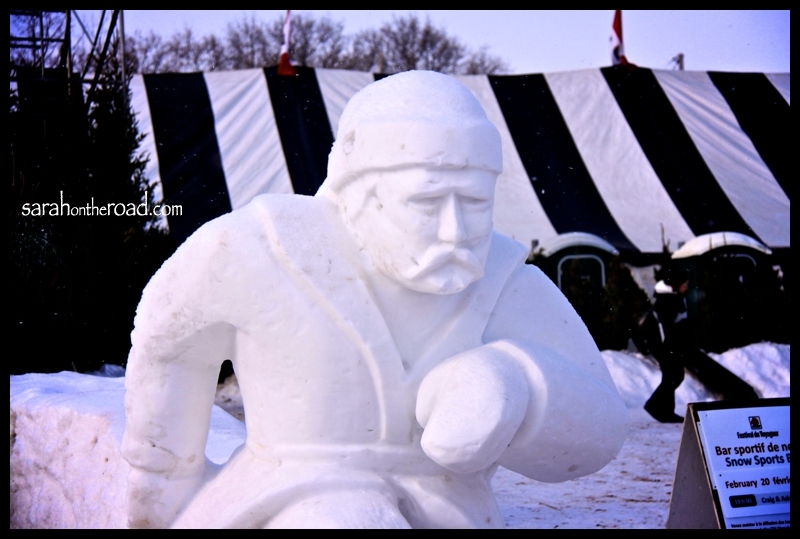 Some were a bit ‘abstract’ and not so ‘voyageur’ themed…but awesome too!!! In the maze…. not so hard for adults because we could ‘see’ over the walls…. but still a lot of fun! Next stop…. 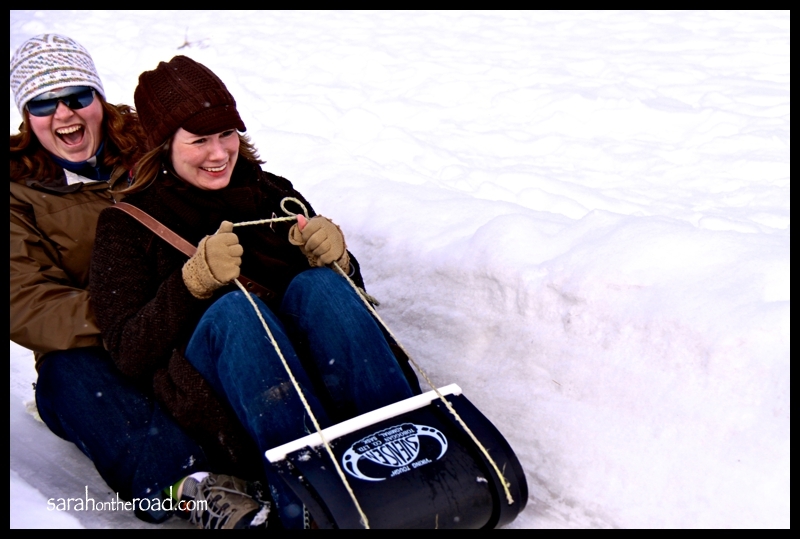 sledding…. 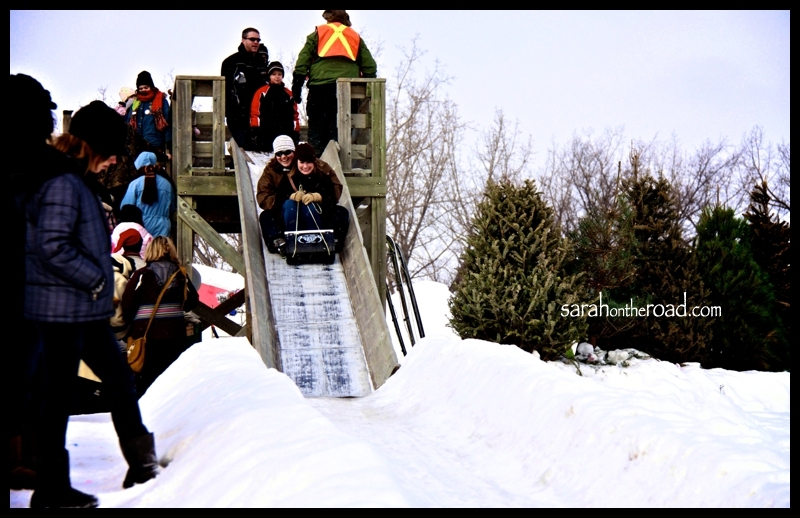 how much fun it was…. apparently Andrea didn’t like the ‘speed’ we picked up!!! Lunch was yummy! I had a ‘meat’ pie with gravy that was yummy.. and hot chocolate… we listened to some awesome live music while we ate…though was hard to ‘talk’ to my friends! 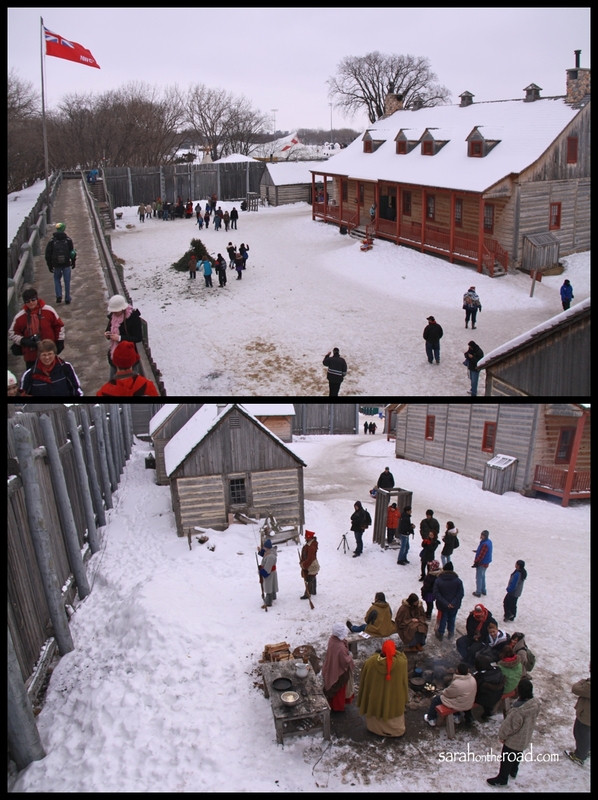 I didn’t get a photo of that band.. but snapped a photo of this one…..
After lunch we split up the groups… some went back to the ‘sledding’ hill.. and others went into Fort Gibraltar … I was in the group for Fort Gibraltar!!! A snap from the “North Tower” the bottom was the ‘fridge’ where they put ice blocks from the river…in hay to keep meat fresh… then the room above that in the tower was a ‘holding’ cell… or jail… for disorderly voyageurs…(hmmmm I think one night sleeping ABOVE the freezer/fridge…would be enough for me).. and then the top floor was a lookout—360degree view…. pretty awesome! The person here is making pemican.. she’s pounded the dry buffalo meat.. now was adding it to the strips of meat, dried berries and ‘fat’… apparently voyageurs ate like 4lbs of the stuff when they were out working…Can you imagine sleeping in a bed like that? just ropes for a mattress… hmmmm I’m glad I wasn’t a voyageur–though the adventure and excitement might have been enough to hook me into that kind of life! This guy was awesome..he spoke really knowledgable… as he talked in the ‘trading’ post room.. about how everything was based on bever pelts… their worth etc. 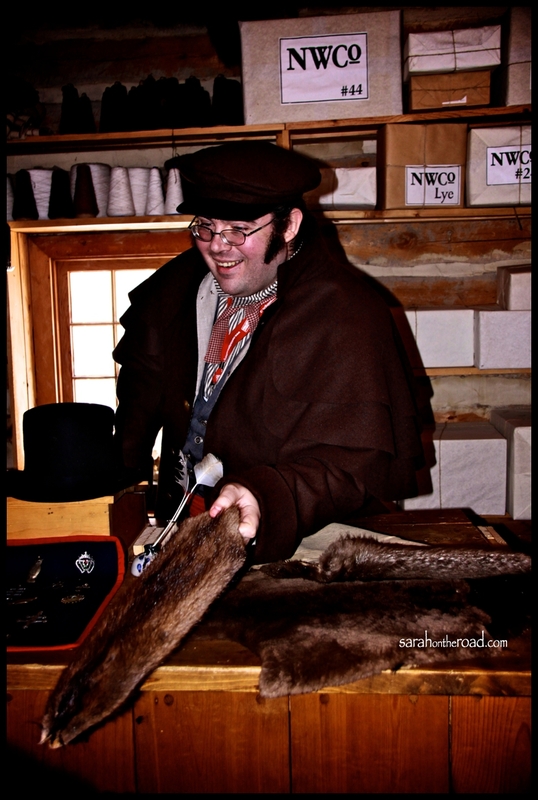 He also talked about the process the beaver pelts went through— in order to turn them into top hats… and how the hatters did indeed often go mad because of the process of the ‘felting’ and the use of mercury. He spoke in a fantastic British accent.. and kept going on and on… made me think.. perhaps I could do something like this in the future!? 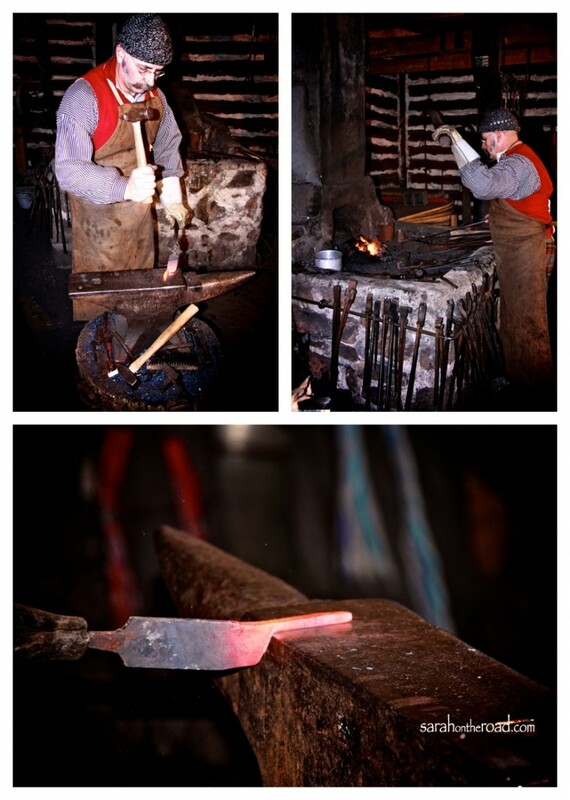 Next was the Blacksmith’s shop..another really fun spot…This guy was making a flint stricker…out of an ‘old’ file…. After that walking around, and learning about times in 1815… it was time for a little ‘sugar’… or ‘suggaa-time’… mmmmm let’s just say this was the most enjoyable… $2 I spent all day….. I wish I had gotten TWO of them!! 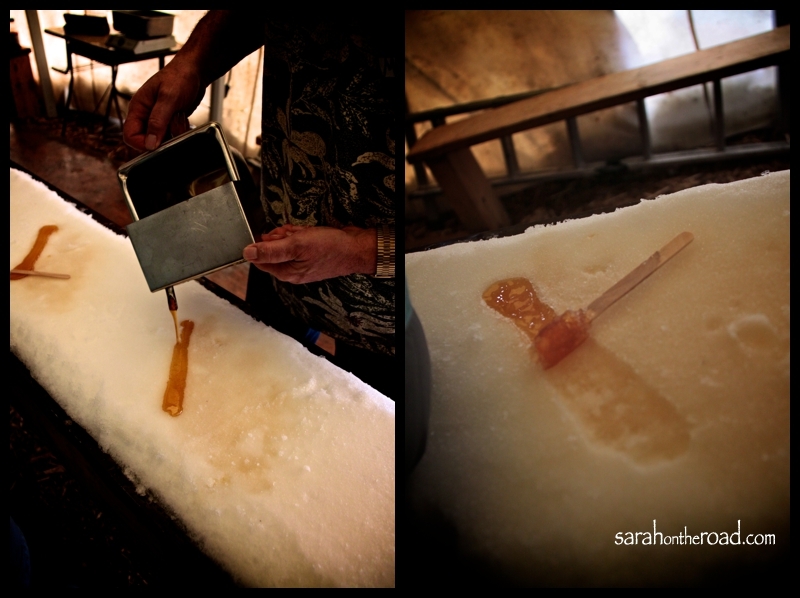 …first the guy poured out all the maple syrup on the snow…… I put my popsicle stick at the end, and then once it hardened a bit… I started to roll it up!!! Guess you can dress me up..but can’t take me out…. 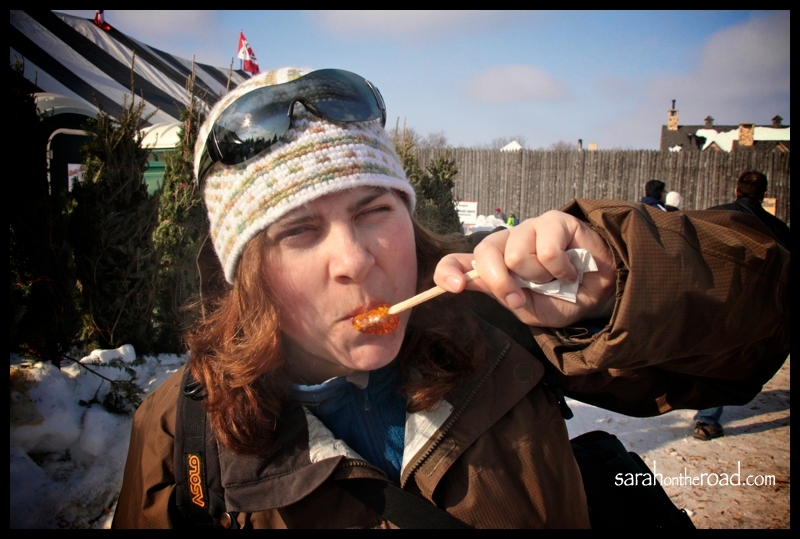 it got a bit ‘sticky’….hence the maple trail out of my mouth onto my chin… But still so worth it!! All in all it was an awesome day… Can’t wait til next year!! 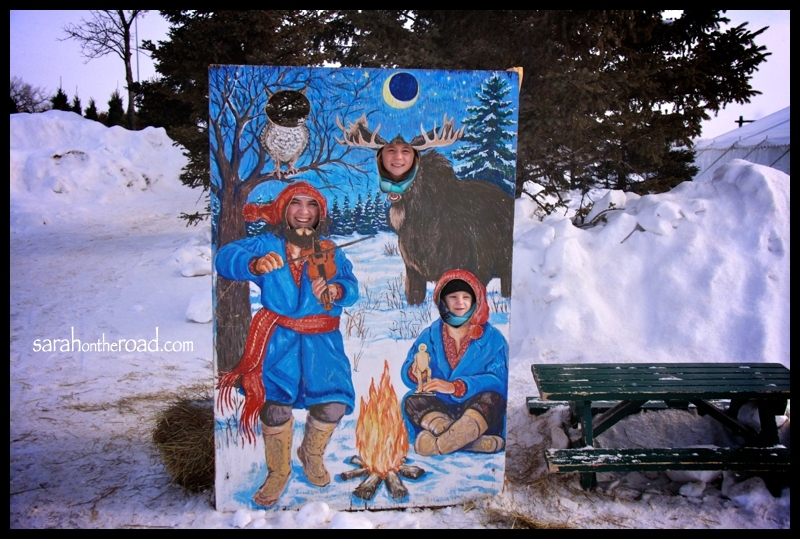 This entry was posted in Life in Manitoba and tagged Festival du Voyageur on February 21, 2010 by Sarah on the Road. Yes, I’ve fallen into it… hook, link and sinker….sooooooooooooooo LUV watching the games… and this week have ended up staying up TOO late.. watching events on my tv. I so wish I was out there…. but I’ve been cheering on our Canada from my couch!! I can’t believe how ‘close’ some of the times are… that separate gold, silver and bronze… sometimes it’s just .01 of seconds… that is the difference between first and 15th! Crazy… it’s nice to see the joy in all the athelete’s faces after they have a really good time, or run or whatever!! The uniforms are fun to see too…. I hope everyone else out there is enjoying the “olympic trap”!! 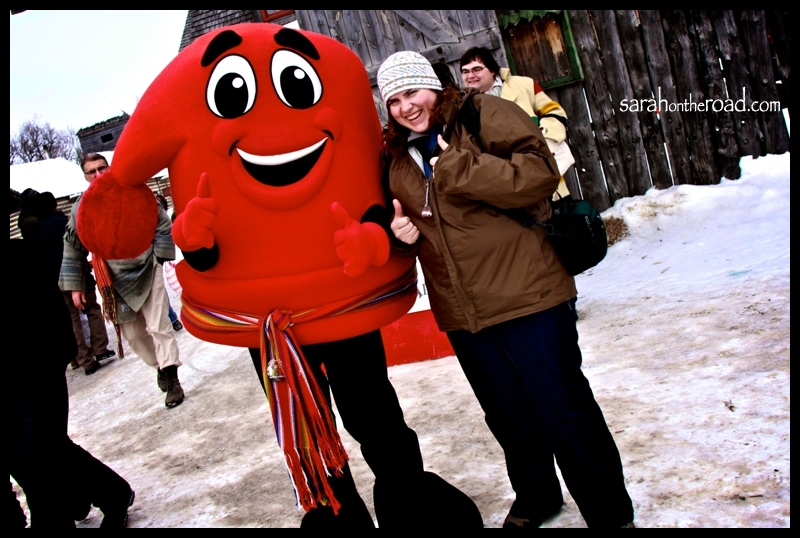 This entry was posted in Life in Manitoba and tagged Olympic Fever on February 18, 2010 by Sarah on the Road. I thought about the amazing family I have…and how they all luv me very much…. I thought about my many friends, new and old…. even though they are far away… I know that they luv and care about me too! 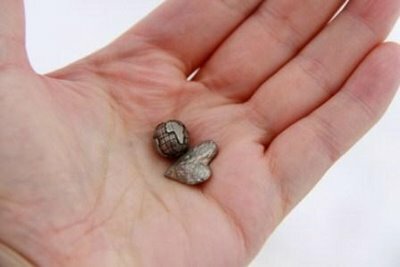 Today I realized why should I ‘BOY-cott’ a day about Love? I mean…. this world needs a little more if it in the world…. My mum sent me this heart and globe to me… when I was living in Australia 6 years ago… with a note “I’m sending you my heart around the globe to you… my luv is never far away”…ever since then I’ve held them very close to me…and often take photos of me holding them in locations around the world…. So what’s my point? even if you don’t have a ‘significant’ other.. and think that this day is a depressing horrible, no good, very bad day…. Just remember…that luv is out there.. and this world needs a bit more luv in it.. Hapy Valentine’s Day… this goes out to all the ‘singles’ and ‘paired’ up people… I hope you had an awesome day… and shared a bit of love with those that were around you in the world today! 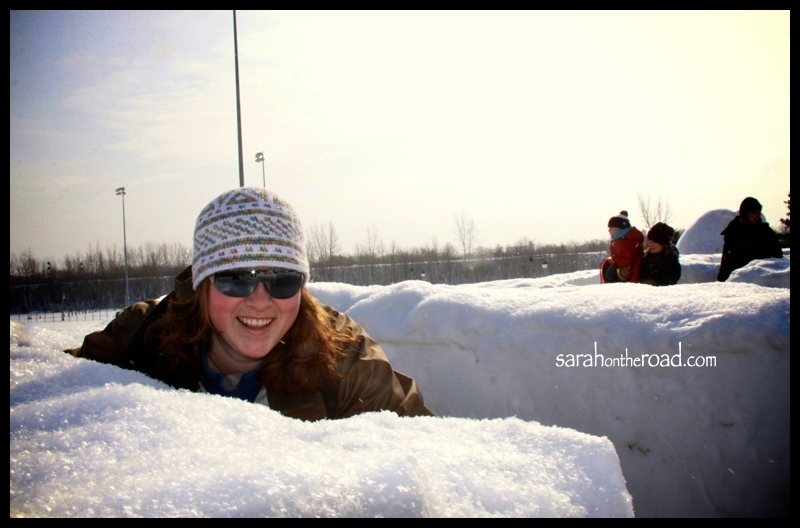 This entry was posted in Holidays on February 15, 2010 by Sarah on the Road. Last night I watched the Opening Ceremonies of the Olympics.. and was on the phone with my mum throughout the evening! She reminded me of my ‘first’ Olympic experience… it was the Winter Olympics of ’84… I had turned 4 in December.. and had started figure skating… apparently I was doing ‘patch’ and did ‘fall school’ then the regular winter season. After watching some of the figure skating on tv, my mum put me to bed. Apparently I looked up at her and said, “Mummy, don’t sign me up for TV yet… I’m just not ready for that yet!” Then my mum realized that all the ‘extra’ stuff was maybe a bit much….. 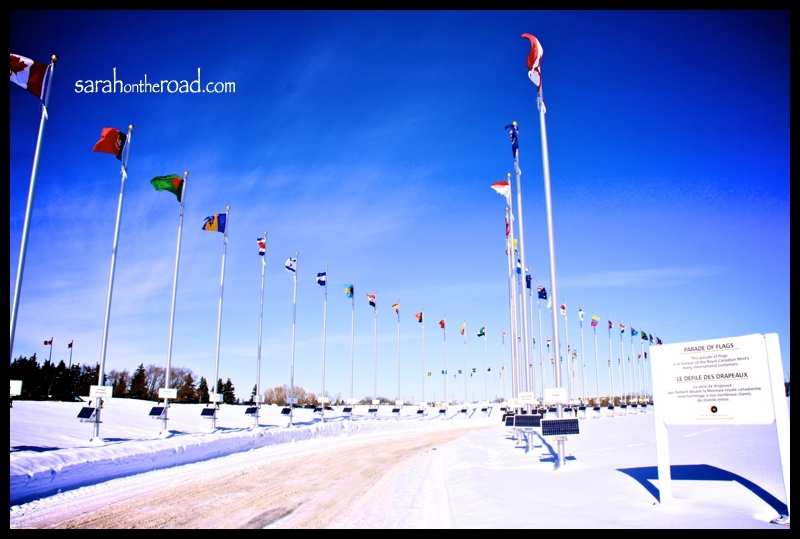 In November I had the opportunity to be a part of the Olympic Torch Relay…. 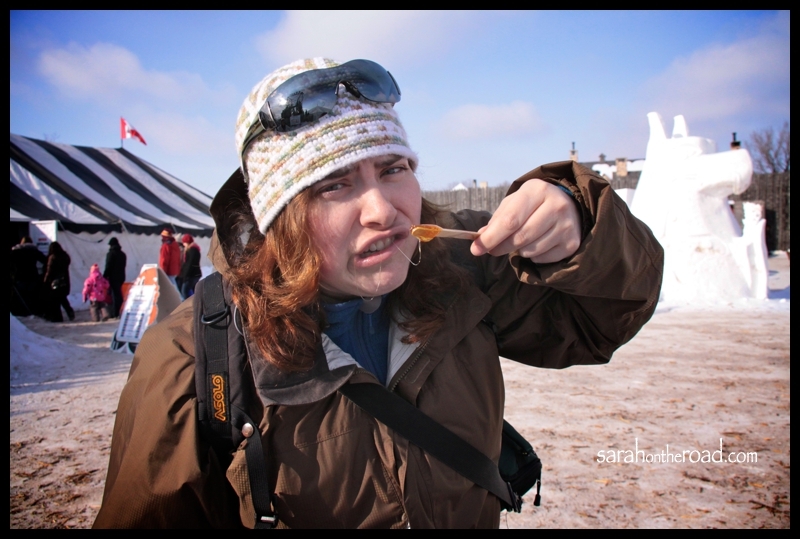 I blogged about it at my old blog (you can see the post HERE)… I was in Resolute, Nunavut at the time… and it was prety awesome to take part of something so HUGE! 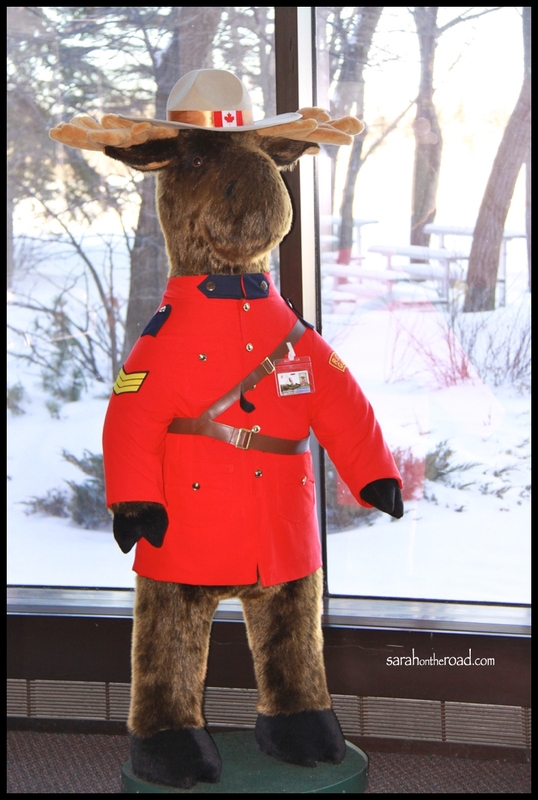 A few days after arriving in Winnipeg, the torch was making it’s way through..but I didn’t go to see it…I had too much stuff going on at the time! 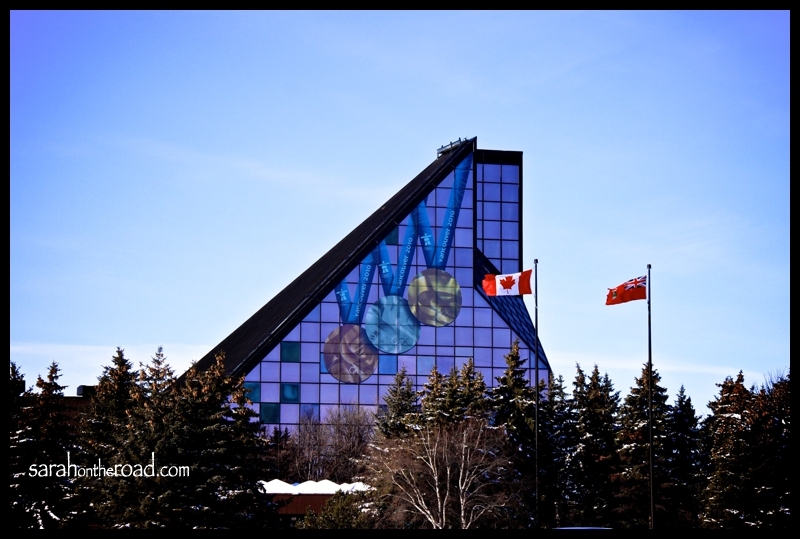 Today I headed out to the Canadian Mint here in Winnipeg… I had heard that the Olympic Medals would be on ‘display’ and you could go see the up close, but not TOUCH. So I headed off and check it out! 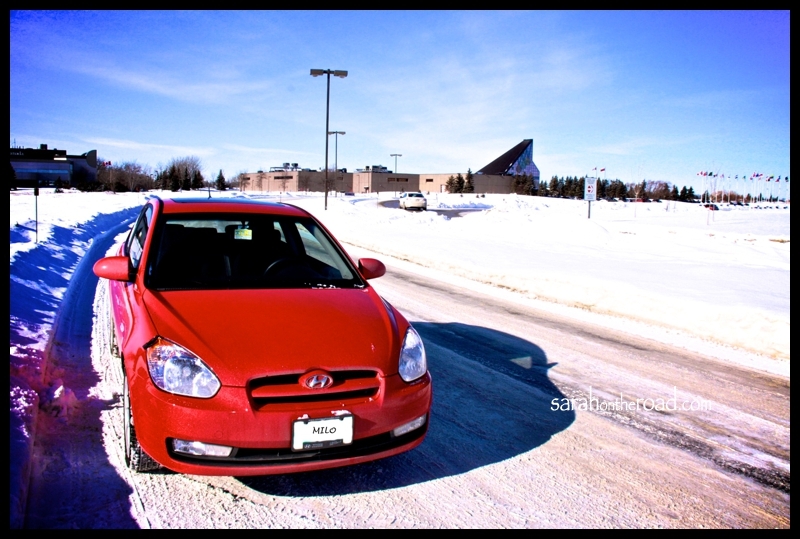 Here’s Milo…in front of the Canadian Mint!! He’s a bit dirty! On the outside of the “Mint” the medals have been reflected onto the building. Inside the Mint there were quite a few ‘interactive’ displays…to see how much you are ‘worth’ if you were different types of coins (based on your weight)….and I got to pretend I was a GIANT quarter.. how cool is that?! 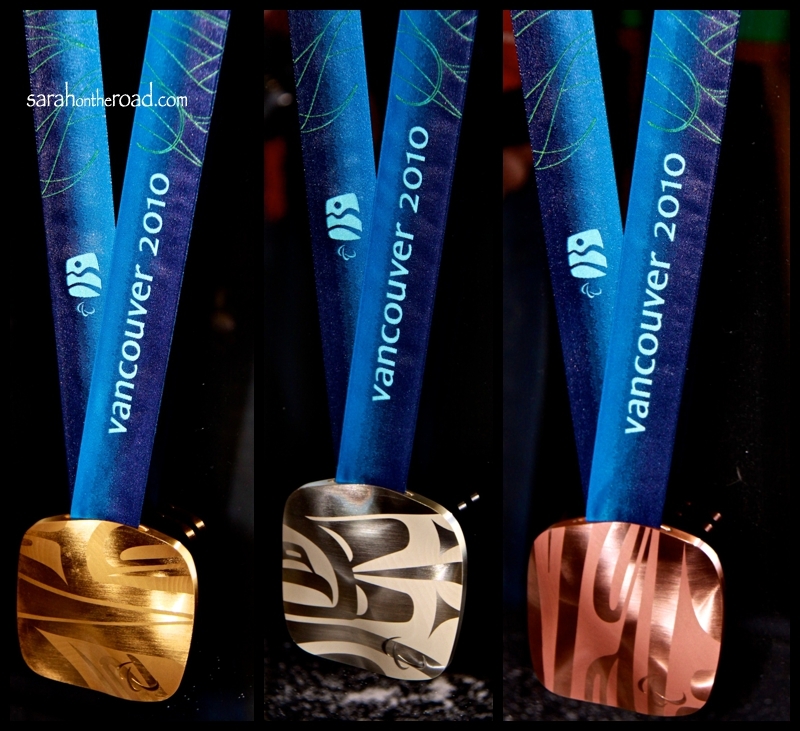 Here’s a close up of the Paralympic Medals… Gold, Silver and Bronze!! Then there was this really cool table set up… and it showed ‘how’ they were made… with the template things and stuff…. it was pretty cool! I got to pick up a medal that hadn’t had the final stage done to it… so it didn’t have the ‘etching’ on it! Here’s a copy of that silver metal…it was sooooo heavy and really neat to touch!!! here’s the front, and the back the back!! 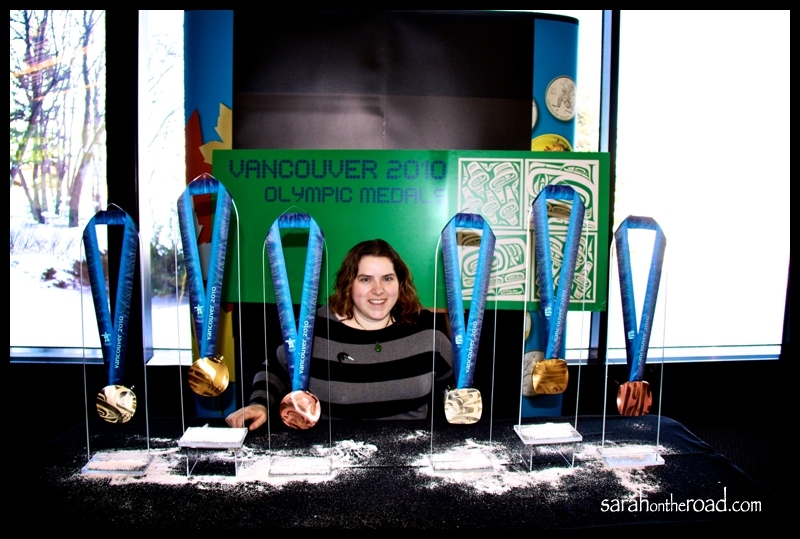 Here are three medals that are completed… the Bronze and Gold are for the Vancouver Games and the Silver is for the Paralympic Games! No two medals are the same. Pretty awesome.. that means the ‘hockey’ players that will win GOLD, no TWO of those medals will be the same–they will be truly a one of a kind thing!! 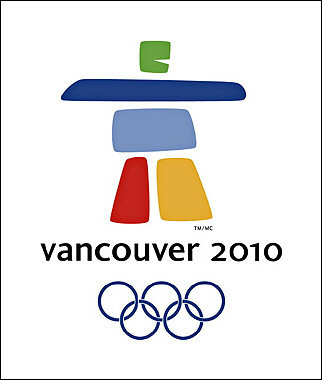 Here on the left is the a copy of the Orca artwork that the Vancouver 2010 Olympic medals were inspired from. 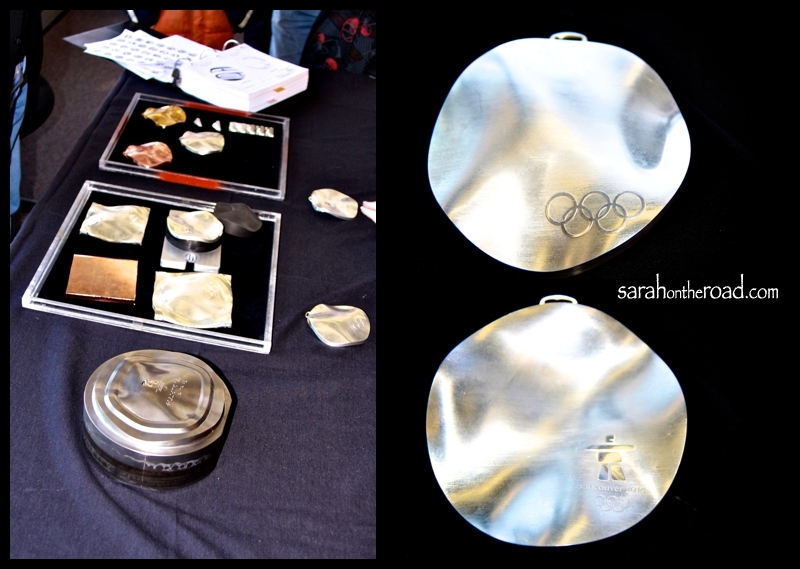 On the right is a copy of the Raven artwork that the Paralympic Medals were inspired from! 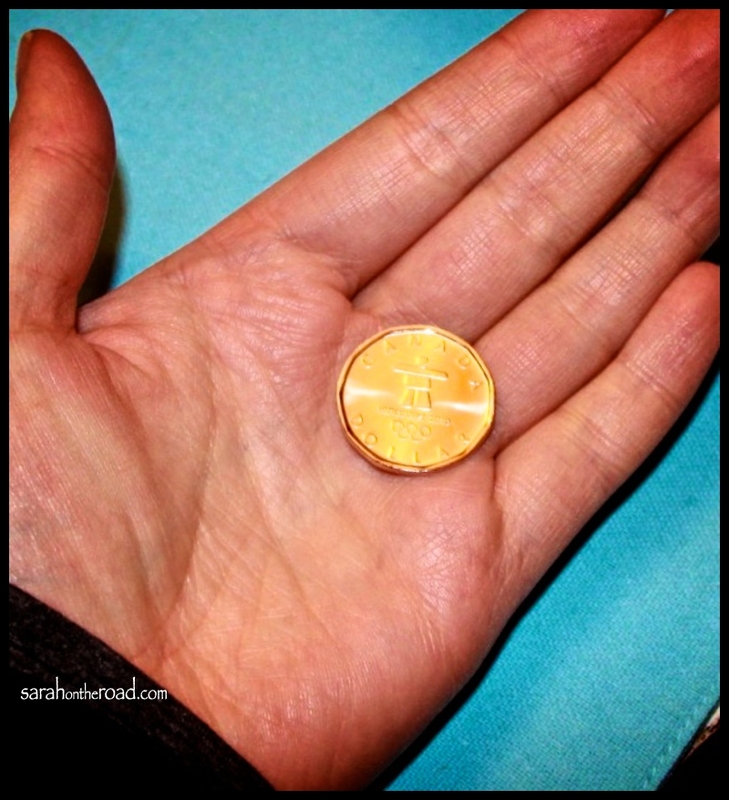 I also did a ‘self-guided’ tour of the actual Mint… I learned about how coins are actually made, and saw all the machines that do the jobs of making them! Sadly, I couldn’t take any photos–apparently this money making stuff is ‘top’ secret…who knew?! 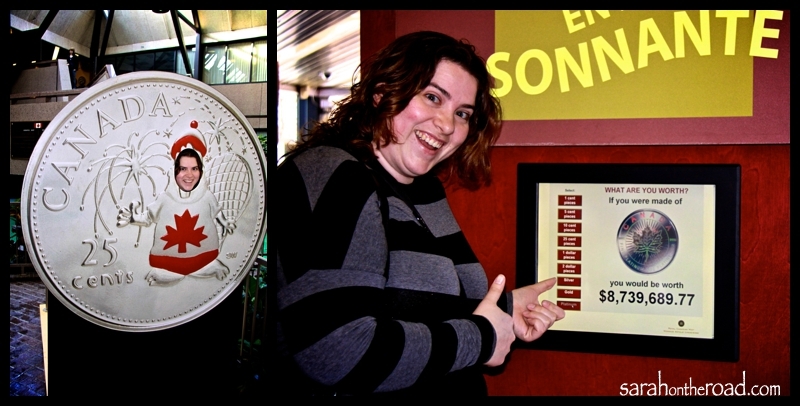 I also ‘traded’ in an OLD loonie for a brand-new Vancouver 2010 Olympic one!! 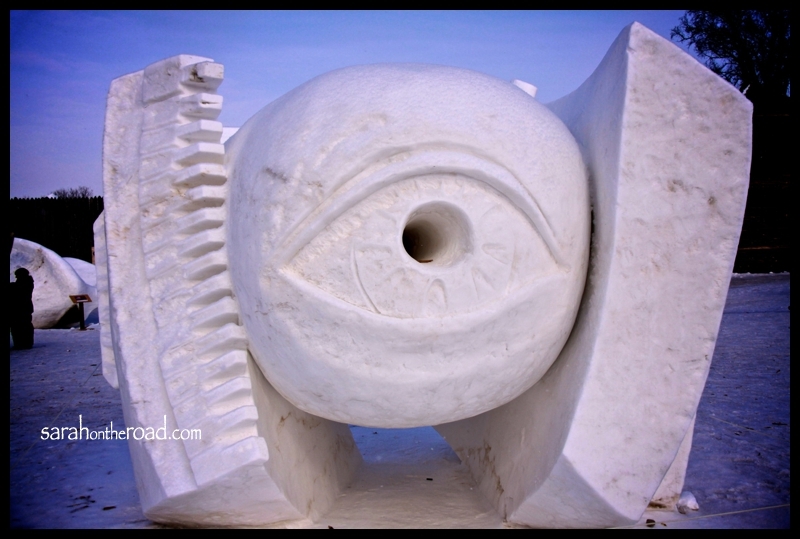 This was an ‘ice sculpture’ that was at the main road entrance to the Mint…. it was pretty cool… as I was leaving I saw that another car had stopped and took some photos… I asked them to snap these of me! So that was my brush with the Olympics…. Hope your weekend is going well… I need to get back to my ‘Olympic’ TV schedule… I think I’m going to watch nothing but for the next 16 days!! 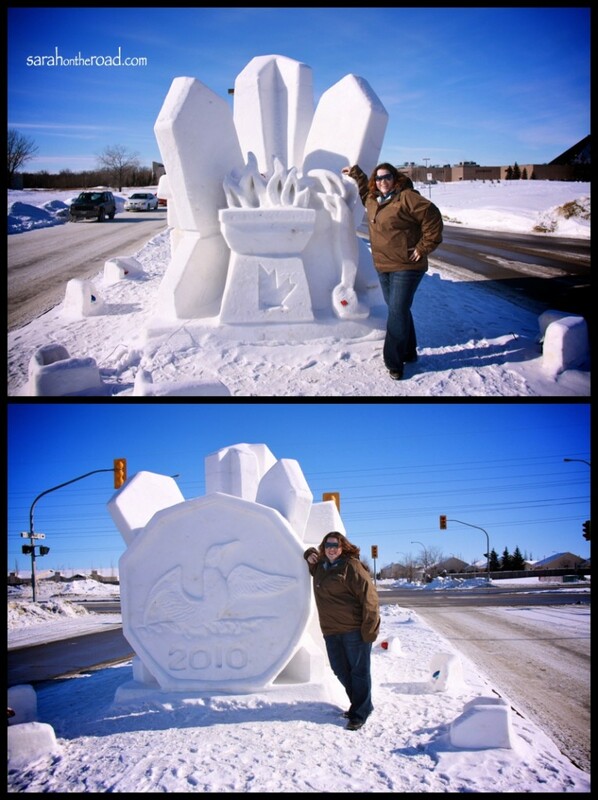 This entry was posted in Life in Manitoba and tagged Milo, Olympic Fever on February 14, 2010 by Sarah on the Road.